Inside my Google Analytics Behaviour->Event->Overview Report I can see all 3 events being traked, but in the Convertion->Goals->Overview Report all 3 have zero records. Any ideas why this is happening? should I set up the goals again (after event tracking implementation)? I found the solution to the problem myself and I would like to post the answer in here just in case someone goes through the same struggle. If you don’t have a value defined in the condition above that matches your Event tracking code, nothing will appear as the Goal Value. Not the answer you're looking for? Browse other questions tagged google-analytics conversions goal-tracking event-tracking analytics-events or ask your own question. Tracking dynamic events in Google Analytics? 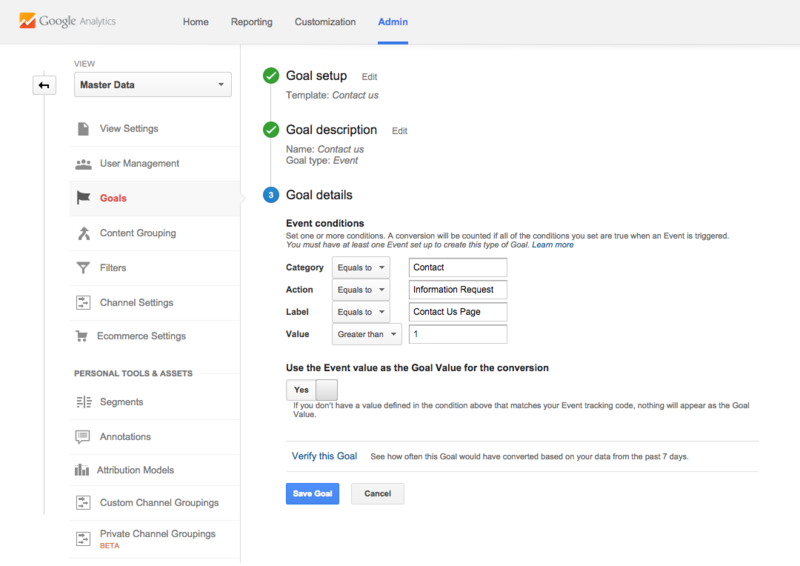 Why don't Download Events and Download Goals match up in Google Analytics?